1. A team led by freshmen and sophomores can’t win a national title. Experience trumps ability in the tournament, at least to some extent. Freshmen-heavy teams like Kentucky will always falter in the big moment because they’re not suited to handle the intense pressure to which older players have become accustomed. That’s why even the superlatively talented John Wall-DeMarcus Cousins-Eric Bledsoe Kentucky team of 2010 couldn’t beat West Virginia and star senior Da’Sean Butler in the Elite Eight. 2. On top of that, Kentucky is perpetually full of great athletes who can’t shoot. They lost to West Virginia after going 4-for-32 from beyond the arc, and it keeps them from being truly great. 3. John Calipari’s success comes with a price. He’s a dirty coach who had to vacate two Final Four appearances — one at UMass and another at Memphis — and he’s more of a snake-oil salesman than a true leader. No one doubts his recruiting acumen, but his lack of strategic excellence (and maybe a dose of karma — see Memphis vs. Kansas, 2008) will always deny him the coveted title. It makes me feel good, reading these words to myself. Unfortunately, they’re bogus, and Kentucky is going to win a national championship. Kentucky’s comeback win over Mississippi State on Tuesday night was just the latest example of the old lies being exposed as nonsense. The Bulldogs held a 13-point lead after the first half, and were up by 10 with 18 minutes remaining. The home crowd in Starkville was acting the way home crowds act when the no. 1 team in the country comes to town and falls behind — they were loud and excited. They smelled blood. Last season, despite reaching the Final Four, Kentucky lost six of these SEC road battles. The year before, they dropped two road games to weaker opponents on the way to an undefeated home season and an SEC championship. This kind of thing was supposed to happen — freshmen can’t win every game on the road. But over that final stretch, with the Bulldog faithful breathing down its neck, Kentucky calmly outscored the Bulldogs 42-23 to win comfortably. And the Wildcats did everything they weren’t supposed to do — they hit 3s, they ignored the wall of noise, freshmen scored the majority of the points, and they showed more composure than a team of juniors and seniors playing at home. Kentucky is now 27-1 on the season. Its one loss came in December against Indiana, in a game in which the Wildcats trailed by 10 with nine minutes left. In that contest, Kentucky was able to claw back and wrench the lead away in front of an even more rabid fan base. Only the now-famous Christian Watford buzzer-beater rescued Indiana, and it remains the one shot standing between Kentucky and an undefeated season. Over and over, the Wildcats have showed composure belying their years, and it’s high time we revisit those comforting lies from above. Yes, most title teams are senior- and junior-heavy. But Calipari’s formula of recruiting five-star prospects who are likely to leave early looks less and less vulnerable all the time. Two years ago, the Wall-Cousins-Bledsoe team lost the fluky West Virginia game and were denied the Final Four. Last year, a less talented squad made a trip to the Final Four before running into the Kemba Walker juggernaut. This year, the road losses and shooting woes experienced by those teams are nowhere to be found, and the overall talent is as great as it’s ever been. Anything can happen in March, but who would bet against this team taking Calipari to the next level — the championship game or the title itself? True in 2010, but this was already bogus last year, when the Wildcats were the ninth-best 3-point shooting team in America. This year, they’re still elite, hitting 38.9 percent from deep, and sophomore Doron Lamb is one of the best 3-point shooters in the country at 48.7 percent. The days of 4-for-32 are long gone, and bad shooting is unlikely to submarine the Wildcats. Sure, he had to vacate the Final Four appearances, but at Massachusetts it was because Marcus Camby took money from an agent, and at Memphis it stemmed from someone else taking Derrick Rose’s SATs. It’s impossible to know how much Calipari knew about either incident, if anything, and it’s not unreasonable to think he was a sort of victim of two bad player decisions. Maybe that’s letting him off too easy, but there seems to be nothing illicit about Kentucky’s current success. Young players bound for the NBA know Calipari can prepare them well, and they’re eager to be Wildcats. He’s the best recruiter in the country, and any claims of impropriety have the bitter taste of sour grapes. 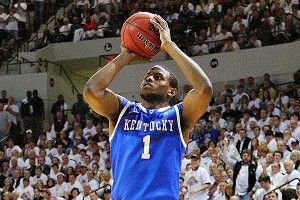 Kentucky has the best player in the country in Anthony Davis, one of the toughest in Michael Kidd-Gilchrist, one of the best shooters in Lamb, one of the best potential stars in Terrence Jones, and a talented point guard in Marquis Teague. The Wildcats have had their share of blowouts, but they’ve also won quality games against good opponents at home (North Carolina, Florida), on a neutral court (Kansas), and away (Vanderbilt, Mississippi State, Tennessee). They’ve earned the top ranking, and there are so few teams who can take it away. Experience matters because it brings composure, but by now we know the terrible truth about Kentucky: They don’t scare.